Oaky tones to start with smooth finish This is an exceptionally smooth rum. Oak and fruit notes on the nose. A sweet but strong initial taste but a wonderfully warm finish. Wickedly smooth. Spices with hints of vanilla. Wonderful caramel color with a warm smooth delivery that resonates with spices. A true delight on the palate with a warm finish. Smooth, smooth smooth. Nice caramel color, oak and floral flavors forward and a smooth balanced finished with what seems like a taste of vanilla and cinnamon on the finish. 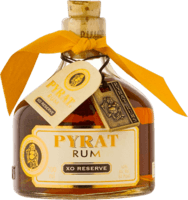 Solid and delicious rum. Not as smooth as others, but a delightful semi-sweet orange-isa rum. Seems like it could be aged a little longer to mellow it out a little more. Good, but not very smooth This is a grid rum, but not what I would consider a super premium rum. It has a little bite at first sip then mellows as it goes down.